When demand warrants it, a two-day-and-a-half training session is offered to people who wish to learn how to teach bridge to beginners. 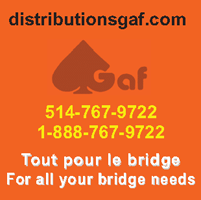 The course is led by Kamel Fergani, ACBL accredited bridge teacher for more than 30 years and multiple-time Canadian champion. Since 1988, Mr Fergani, an ACBL-accredited star teacher, has trained a number of teachers still active in the bridge community. Pass the exam (course materials are allowed during the exam). For more information, call Christine Bourbeau: 450 687-4797.